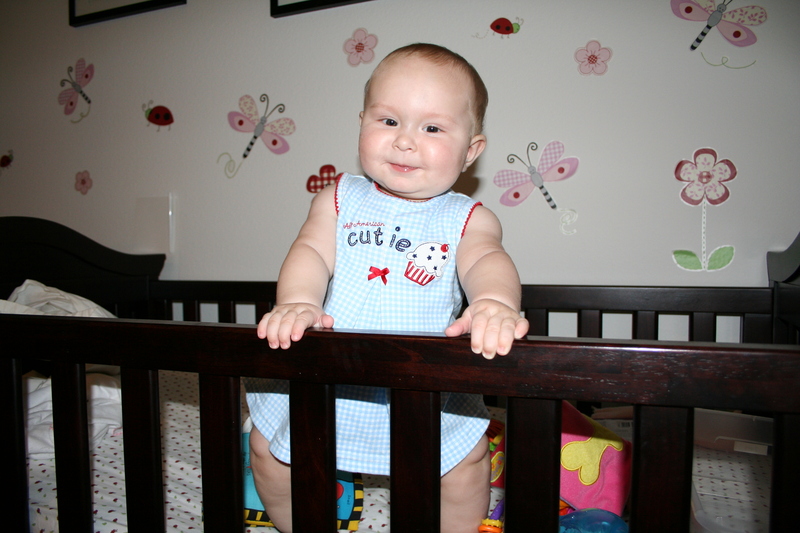 Can you imagine the carnage if I waited until she was eighteen months old to lower the crib mattress? Matt took the day off today.Â He needed that. I just had to temporarily stop writing to open my newest Etsy purchases!Â I got these for me and this and this for the Babyface.Â Did I mention that this is what I do with all my shop revenue?Â Just spend it all on Etsy?Â I’ve got two more sets of things coming too.Â Hopefully soon. Did you know that the baby’s two most used nicknames are Babyface and Cheekies?Â I don’t use them on the blog that much, but that is pretty much what we call her.Â Well, that and Elizabeth, ‘Lizabeth, Baby, Cheekyface, Fuzzyhead, and Crazyface.Â It kind of depends what mood she’s in.Â She gets called Crazyface right before bedtime a lot, when she’s running around with wild eyes. It took Elizabeth a full two hours to fall asleep for her nap today.Â Yesterday she fell asleep in less than thirty seconds.Â Babies are weird. I got her Fourth of July pictures taken yesterday.Â I will see if I can upload them here.Â I might not be able to though, I think they figured out people were doing that sort of thing and they changed their settings. One of my posts was in the Friday Blog Roundup this week.Â So go participate in the conversation. Go join Danifred for more Friday Night Leftovers!